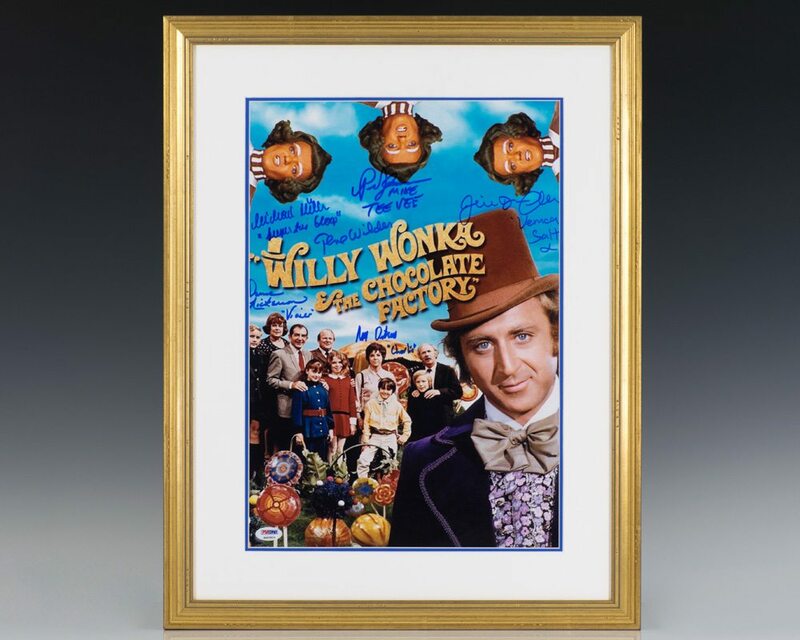 Willy Wonka and the Chocolate Factory Signed Photograph. Wilder, Gene; Peter Ostrum; Julie Dawn Cole; Denise Nickerson; Paris Themmen; and Michael Bollner. Large photograph of Willy Wonka, the five golden ticket winners and their parents and a trio of Oompa Loompas. Boldly signed in by Gene Wilder, Peter Ostrum, Julie Dawn Cole, Denise Nickerson, Paris Themmen, and Michael Bollner, with each but Wilder adding their respective character names from the 1971 film. The photograph measures 12 inches by 17 inches. Double matted and framed. The entire piece measures 17.75 inches by 22.75 inches. An attractive piece. Willy Wonka & the Chocolate Factory is a 1971 American musical fantasy film directed by Mel Stuart, and starring Gene Wilder as Willy Wonka. It is an adaptation of the 1964 novel Charlie and the Chocolate Factory by Roald Dahl, who himself wrote the screenplay. The film tells the story of Charlie Bucket (Peter Ostrum) as he receives a Golden Ticket and visits Willy Wonka's chocolate factory with four other children from around the world. Filming took place in Munich in 1970, and the film was released by Paramount Pictures on June 30, 1971. In 1972, the film received an Academy Award nomination for Best Original Score, and Wilder was nominated for a Golden Globe as Best Actor in a Musical. The movie introduced the song "The Candy Man", which went on to become a popular hit when recorded by Sammy Davis Jr.. In 2014, the film was selected for preservation in the United States National Film Registry by the Library of Congress as being "culturally, historically, or aesthetically significant".